The Summer at the Stone House event series continues on August 22nd! 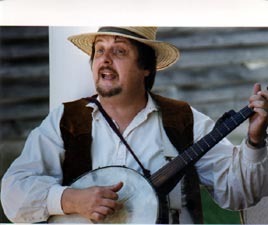 Allen Hopkins, musician, will be presenting Cowboy Songs. He plays American traditional, Celtic instrumental, a bit of Yiddish, blues, bluegrass, old timey, and contemporary. With varying degrees of expertise, he can handle guitar, banjo, mandolins of all sizes, Autoharp, English concertina, harmonica, bass (acoustic and electric), Dobro, Appalachian dulcimer, ukulele, and other odd instruments from tiple to kalimba.